The four-day daily fantasy golf sweat is one of the best experiences in DFS. It also might be one of the worst. You spend Thursday and Friday hoping enough of your guys make the cut so you can even have a full four-day sweat, then if enough do, you spend the weekend watching your dollar signs go up or down. Whether it’s your first time playing daily fantasy golf or you’re just looking for another edge, here are nine tips as we get ready for the 2019 Masters. This one is simple: You need to know how scoring works. On DraftKings, you get just +0.5 points for a par. You’re also only docked -0.5 points for a bogey and -1.0 for double bogey or worse. Otherwise, you’re rewarded +3.0 points for birdies, +8.0 points for an eagle and +13.0 for a double eagle. 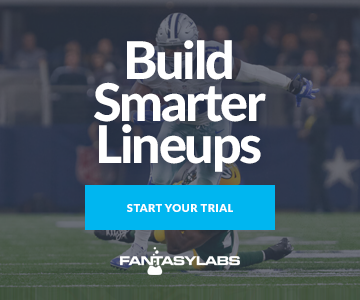 You’d ideally want to bake as much upside into your DraftKings lineup as possible by targeting golfers who excel at making birdies and/or eagles, especially for guaranteed prize pools (GPPs). However, there are events that you want to pay attention to bogey avoidance. The Honda Classic, for example, is played at PGA National — one of the toughest courses on tour, yielding just 39.13 DraftKings points per tournament and an average -9.57 DraftKings Plus/Minus to competing golfers. When I backtested the metrics in our FantasyLabs’ Trends tool, long-term and recent bogeys were the top two metrics that backtested favorably for golfers, so there was an advantage to target golfers who could avoid disastrous holes. Still, every week will be different. It can be difficult to get 6-of-6 golfers through the cut. For cash games, 5-of-6 will suffice most weeks. Sometimes even 4-of-6 will be enough, depending on the week and/or if you get placing bonuses for high finishes. You can see just how valuable consistent golfers can be using our Trends tool. Historically, golfers who rank below the 50th-percentile in long-term missed-cut rate average just 45.48 DraftKings points per tournament with a -0.39 DraftKings Plus/Minus and 44.6% Consistency Rating. Meanwhile, golfers who rank in the top 50th-percentile have averaged 55.98 DraftKings points per tournament with a +2.16 DraftKings Plus/Minus and 52.9% Consistency Rating. As you begin playing PGA DFS, you’ll see that betting odds are typically highly-correlated with a golfer’s salary. Sorting by Vegas odds in our FantasyLabs’ Player Models is one way to find potentially underpriced golfers. Kevin Kisner ($6,700 DraftKings; $8,700 FanDuel) is a great example for the Masters. He has the 27th-best odds to win as of writing. Now is he actually going to win? Probably not. But he’s priced outside the top 50 golfers on DraftKings, making him a solid value. My colleague Bryan Mears discusses his Vegas Bargain Rating metrics in more detail here. Long-term and recent Adjusted Round Scores are my favorite catch-all metrics when evaluating golfers. For the Masters, for example, Tony Finau ($8,200 DraftKings; $9,900 FanDuel), Patrick Cantlay ($7,700 DraftKings; $9,900 FanDuel) and Webb Simpson ($7,400 DraftKings; $9,500 FanDuel) all have excellent LT Adj Rd Scores that rank in the top 12, but their prices don’t reflect that. Finau is priced as the No. 20 golfer, Cantlay as the No. 25 and Simpson is outside the top 30. Mears also touches on more DFS and betting values for the Masters here. Every week is different in PGA DFS, and I prepare for each one by backtesting all the metrics in our FantasyLabs’ Trends tool — it’s a quick way to eliminate most of the field and figure out which guys I want to target. However, not every golfer is suited for every course. The RBC Heritage is one of the shortest courses on tour where accuracy is rewarded instead of length. So, for example, maybe paying $12,000 for Dustin Johnson compared to $10,800 for Matt Kuchar might be a closer decision than you think. DJ is easily the superior golfer, but you can do a lot with the $1,200 in savings. DJ still ended up being a solid play that week because he can just club down off the tee box. That course can get windy off the coast of South Carolina, and he’s an excellent player in the wind. But it’s up to you to decide whether paying $12,000 for him is optimal for your roster that particular week. I don’t overanalyze wind, but it can be worth consideration some weeks. There are instances in which you can stack certain tee times and have an advantage. If a morning wave is expected to have less windy conditions than the afternoon wave, for example, it could be worth consideration. It’s especially valuable on Showdown PGA slates, when you’re just playing that single round of golf. Historically, golfers with tee times that have a wind score in the bottom 50th-percentile have averaged a -1.15 DraftKings Plus/Minus with a 46.3% Consistency Rating, while golfers in the top 50th-percentile have averaged a +2.65 DraftKings Plus/Minus with a 51.1% Consistency Rating. One way to differentiate your roster in tournaments is to simply pivot to the lower-owned golfer at a comparable price range. At last year’s Masters, Justin Rose was incredibly cheap (by his standards) at $9,200. And as a result, he was 33.2% owned in GPPs. But if you wanted to be slightly more contrarian, you could’ve just as easily pivoted to John Rahm at $9,300 and 11.5% ownership or Rickie Fowler at $9,000 at 12.6% ownership. And either alternative option would’ve worked out: Rose scored 77 DraftKings points while Rahm and Fowler scored 103 and 108.5 DraftKings points, respectively. You don’t need to roster a bunch of 3% owned golfers to be contrarian. Every week is going to be different in PGA DFS, so it’s important to think rationally — especially if you get burned by a golfer. One way to do this is to dig a little deeper into why that golfer struggled that particular week. Take Hideki Matsuyama at this year’s Arnold Palmer Invitational, for example. He was a relatively popular play that week, but he managed a meager 33rd-place finish. But all of his struggles were due to putting. He gained 11.6 strokes tee-to-green and 6.7 strokes on approach, but he lost an absurd 8.3 strokes putting. That finish might’ve deterred some DFS players from rostering him at the Players the next week, but he actually carried more ownership that week. He rebounded and finished in eighth place after he gained 7.2 strokes tee-to-green, 5.5 strokes on approach and his putter ran better as he gained 2.3 strokes putting. Similarly, if a golfer has a red-hot week with his putter but is struggling in areas like off-the-tee or in their approach game, then maybe they’re a better fade that week since putting can be incredibly streaky. It’s not necessarily that you should fade recent performance altogether, but be aware that not all results are created equally. This is one way to avoid duplicated lineups in GPPs. Utilizing our FantasyLabs’ Contest Dashboard, I found that 45.6% of entries used 100% of their salary cap in the Millionaire Maker for last year’s Masters, which would give you higher odds of splitting the top prize with an abundance of people. Meanwhile, 21.4% of entries left $100 on the table, 11.6% left $200 remaining and 7.5% left $300. Each $100 remaining cut the percentage nearly in half. In a stacked field like the Masters, not using the full cap likely won’t force you into any suboptimal builds. And leaving some salary on the table can boost your odds of having a unique lineup, giving you the $1 million all to yourself. Note: Strokes Gained data via Fantasy National.